Site Map : Notice Board Beware :: Beware of touts and job racketeers trying to deceive by false promises of securing job in Railways either through influence or by use of unfair means. Candidates attempting unfair means shall be disqualified and legal action shall be initiated against them. | Best viewed with 1024 x 768 screen resolution. | This site has been designed and hosted by NIC, BSU, Patna. CEN 01/2018 : "Click Here for the Exam Trade Syllabus for Part-B of 2nd Stage CBT"
CEN-01/2018 : Forgot Registration ? Click Here. “Trackman : How they work in Indian Railways"
Beware of Touts, Brokers and Job Racketeers. Click here for more details. Click here for Registration and Downloading of the Request For Qualification (RFQ). 27/10/2017 : Notice for the candidates shortlisted for document verification for various posts of NTPC (Graduate) against CEN No. 03/2015. Click here for formats for various certificates required from candidates who are shortlisted for Document Verification for NTPC (Graduate) posts against CEN No. 03/2015. 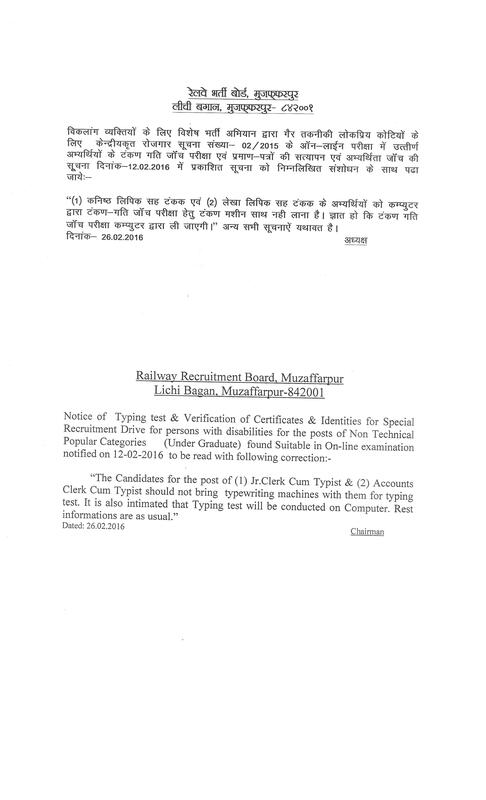 Kind attention: Notice for candidates appeared in 2nd stage CBT, Typing Skill Test and/or Aptitude Test for various NTPC (Graduate) posts against CEN-03/2015. Vision Standards for Ex-Servicemen for the post of ASM and Traffic Assistant (CEN 03/2015). Result of 2nd Stage Exam. (CBT) : Click here to view provisionally shortlisted candidates for Aptitude Test for the post of ASM, Category No.-07 against CEN No. 03/2015. "Click here for mock test of Aptitude Test for the post of ASM and Traffic Assistant against CEN No. 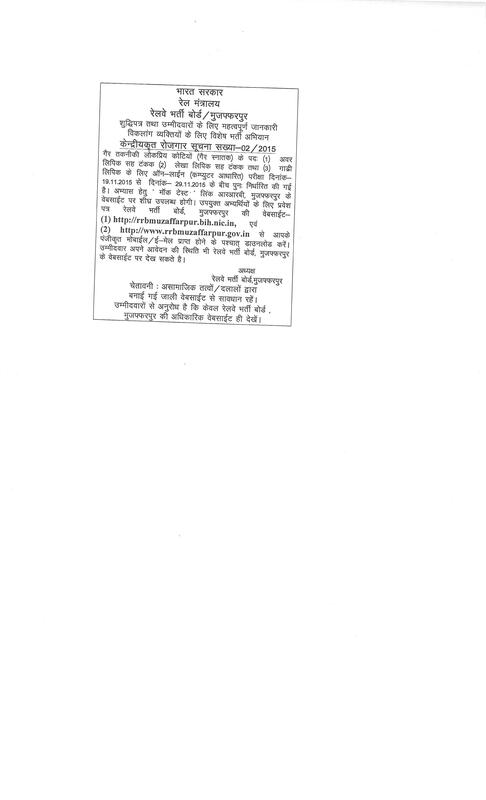 03/2015"
The candidates, before filling up of fresh preferences for NTPC (Graduate) posts against CEN 03/2015 should ensure that they fulfill the medical criteria of that post keeping in mind that no alternate employment will be given in case the candidate is found medically unfit for the post as per Para-9 of CEN 03/2015. Application Status Available For CEN No. 04/2010 for Commercial Clerk & Jr. Clerk. Application Status Available For CEN No. 05/2012 for Health & Malaria Inspector. Application Status Available For CEN No. 01/2012 for Sr. Section Engineer and Junior Engineer Post. Application Status Available For CEN No. 01/2011 & CEN No. 02/2012.